I find the Lahey way of plopping the dough into the pot quite violent, and I know for a fact it messes with my loaf. I always thought a stiffer dough was the answer, but I like my doughs very slack. Glad you are going to try the "bowl roll". Think you dough will thank you. Please let us know the results. As you no doubt are aware, Peter Reinhart uses oil frequently, and to me that's just smart cooking. I bake Lahey formulas 4 times a week, for my home and some folks at the office. I don't particularly care for the wheat bran, so I use semolina, as he suggests as an alternative in his book, in an oiled and heavily dusted brotform, and the semolina makes for a lovely top crust. When I do a round, I can do it in two or three different vessels, with two or three different results, several different shaped and sized clay pots, or a 2 1/2 quart Le Creuset we primarily use for boiling and cooking rice, which gets consistent good results, although the final shape more closely resembles a round loaf bread. I find that when I do Lahey's Italian baguette, "Stirato" I get excellent results by not covering it in any way, but to simply steam/hearth baking it like I would any other baguette. So many people say they love semolina, so your post clinched it. Tomorrow I'm going to get some. I was interested in you reference, (Ron? ), to "Stirato" baguettes. Can you tell me more about them please? And it makes sense to use a lid-less pot for baguettes, with steam. Definitely going to try this. But my search for the proper shaped pot has turned up nothing remotely appropriate, so could you expand on what shaped of pot you use for baguettes. By the way, I have pretty well settled permanently on PR's Ancienne method for baguettes, including especially the "pull/don't shape" forming advice. I cannot see how they could be any better. They come out with this unworldly crust and crumb texture and taste that gets me raving each time about how unworthy I am to make this bread without knowing squat about baking!! This applies equally to Lahey's method, which is so damn suspiciously simple, Homeland Security is probably going to have to lock him up. My loaves don't stick in my hot pots, and in fact they clean up easily, so I don't dare bake from cold for fear that they will gum up. And I guess my other worry would be that the timing (Lahey's 30/15 rule of thumb) may be thrown off. My motto has always been "If it isn't broken ...." However, (Ron? ), if you do try doing it from cold, kindly let us know what your experiment shows, would you? Stirato baguettes - almost exactly the same basic Lahey formula, i.e. 3 cups of bread flour, 1 1/2 cups of water, 1 1/4 tsp of salt, and 1/4 tsp of instant yeast. Same first ferment time, 12-18 hours, but I don't have patience to wait 18 hours. Take the dough out after the first rise, and pull it into a rectangle, gently roll it and tuck it and roll it out to one large tube, cut into three (he says 2) and let rest for a half hour. You can shape them into baguettes, also by pulling and gently rolling and let them rise for 1 1/2 hours. I then slash them, and put them on the stone thats been preheating for about 45 minutes, and pour some water in the steam pan. His instructions are to bake them under the lid of the LaCloche baguette clay pot, but I don't do that. I like the way they spring, and I'm happy with the finished bread plus I can bake all three at once, where if you use the LaCloche cover, you can only do one at a time. I had been baking his formula for awhile, and I have the book, when I took a trip to NYC and visited the Sullivan Street Bakery, which is not on Sullivan Street btw. What he advocates, he bakes. It is good and what I bake at home using his formula is pretty close. Not able to get on the web to answer you until just now. Sorry for the delay. Thx for Stirato recipe & shaping tips. I know about, but have never tried to simply roll-up dough from the rectangular. Will try this soon. Meanwhile, I am sold on the Reinhard method of simply flouring and slicing off a piece and pulling it into a rough baguette/fiscelle shape, since this always has given me a superior crumb structure. And as I said in my earlier post, I see no point in fermenting at room temperature when cold first fermentation has been proven superior, over and over again. You don't say whether you acually have baguette-shaped pots to bake in (as opposed to covering bread with "lids" and baking). I can't find any, but want to, because my perforated baguette pans don't work well for me, and my present method of baking on pan or stone without dough supported in any way, relies too heavily on oven spring to round-up the flattened-out loaves during baking. So, I could couche them, but then that makes transferring to oven too long a process, during which my oven cools from 500F to about 400!! Therefore, I'd love to use hot baguette-shaped "pots" in the same way I use my round and oval pots (see my first post above on this. ), except with steam and without lids. Maybe I should broaden my web-search and look at non-baking sites, to see if I could find what I'm looking for. Regarding Peter Reinhart's pain a l'ancienne, he has two different techniques, one from BBA, and the other from Artisan Bread Everyday. Which one are you using? I've used both but I've always gotten good results form the BBA. There are also some pretty decent variations on this site that have tried to emulate Philippe Gosselin's technique more closely. In Hamelman's book, he has a French bread recipe that calls for a 3 hour bulk fermentation with two or three stretches and folds, which really isn't too bad if you want bread in about 5 hours. I formulated it Saturday night and cold fermented over night, baking it yesterday. I couldn't tell the difference between the cold fermented one and the 5 hour one to tell you the truth although fermenting it overnight made me feel better. Thanks for info on pots. Will follow up @ Breadtopia. I use the BBA. Yes, have read several TFL variations but have yet to try any of them. How many hours was the dough actually in the fridge, Ron, and how many hours was the dough at room temp afterwards, before you put it in oven? Did you use the same yeast weights in both your warm and cold ferments? If too much yeast used in cold fermentation, then I feel the advantage of the cold process can be considerably negated. I should mention that my best-tasting baguettes never rise appreciably in the fridge, and that it takes a minimum of 6 hours at room temp, (after a miminum of 24 hrs in the cold), to arrive at the dividing/shaping phase. But in my method, I go further: I return the dough to the fridge after the 6 hours, and give it another 24-hour sit, then another several hours out of fridge to warm up, and up to a 1 hr rest after pulling dough into baguette shape. I never do S&F's when long ferments are involved. I guess I caught the "cold bug" from AB5MinD --- where, in line with their claim --- the bread tasted better and better the longer it stayed in the cold after the room temp ferment. Then, after reading BBA, and discovering how fabulous the product was following directions exactly, I reasoned (and probably many others have reasoned the same way) that starting out cold, going to warm, and then back to cold, may be even better. But you know what, I am going to try to duplicate your experiment when I learn a few more details about how you proceeded (please!) and I promise to fill you in on the results. Of course, we are talking two different recipes --- mine and Hammelman's. But I circled his recipe in my log book a couple of weeks ago, and promised myself I would take a crack at it. Question: do you weigh out the dough before shaping / pulling? 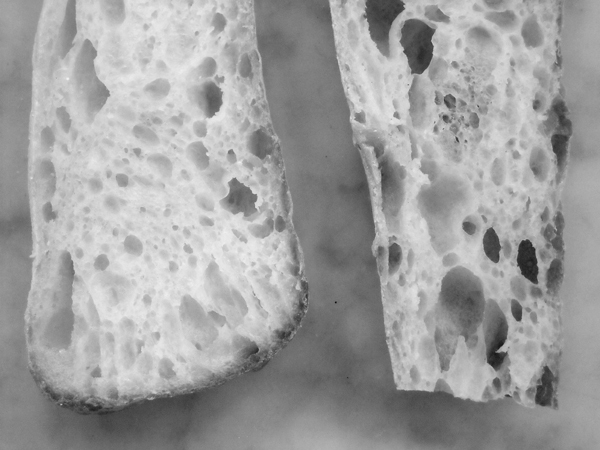 A final question, Ron: is your rolling-up of rectangular dough to shape baguettes accompanied by surface-tension-tightening technique? Yes, I weigh out the dough. I weigh before mixing, and I weighed out 10 oz. for baguettes. The Hamelman was in the fridge about 7 hours and it rose nicely. I actually stretched and folded several times during the refrigeration process. It was out of the fridge about 3 hours. The final was an hour and a half, and I used the same amount of yeast in the beginning. As I read Hamelman, it wasn't the yeast consideration, it was time and stretching and folding. When I mix up the pain a l'ancienne, my dough will triple overnight. The BBA formula doesn't include stretching and folding whereas ABE does. Hamelman is a big advocate of stretching and folding and as I read Reinhart, only recently. OK, got the details I needed, for which I thank you very much. S&F, as I understand the "literature", speeds up fermentation (among several other effects), which is contary to what I want. Bakeries are of course always interested in time (which equals money), so I can understand the place S&F (and other kneading techniques) hold in their hearts. For me, who never met a tight crumb he liked, the road leads away from Le S&F when baking rustic-ally. But this is not to say S&F do not have a very important role in artisanal baking. You imply the quest for superb crust is more difficult than the search for the perfect crumb, and I agree. So many variables, so little control in our amateurish kitchens. I was talking to the owner of the best pizza parlour in Toronto (and there are gadzillions of them in this cosmopolitan city of 2 million souls), and he insisted he could never achieve what he has achieved with an oven less than 800F. He claims he actually runs his ovens at about 950F, and the pizzas are done in seconds. So, yeah, it makes sense that the perfect crust may forever elude the baker stuck with his relatively cool oven temperatures. If you look back in my blogs, you will see a photo of a fresh tomato pot bread along with a sundried tomato pot bread. Now THAT crust --- I don't know about you Ron --- is my idea of a crust. When the breadknife cut into it, chips went flying everywhere. My theory is that the natural sugars in the tomatoes were responsible for the difference between those crusts and the much thicker, harder and chewier crusts produced with just the traditional four ingredients. Whenever Hamelman directs S&F he says he it strengthens the dough, which may mean it speeds fermentation, I don't really know, but it probably does. Personally, when I make bread, its not for museum display, or a photo montage, it is to eat as fast as humanly possible and to be as good, if not better, than the local bakery, which is quite good indeed. My wife tells me my bread is better, but I'm self effacing, so what do I know? A friend of mine owns a restaurant with a wood fired oven, and I would say his crust is the best I've ever had. Unfortunately, theres very little taste in the crumb, however, I would never say anything about it. In his case, the crust is so good, it almost doesn't matter. He says he adds some sourdough starter for taste, but it eludes my tastebuds. Next time I see him, I'm going to see if he would let me bake some bread in his oven some morning around when his baker does. I'll check your blog if I can find it. How do I find it? As I understand it from the books, S&F-ing redistributes the multiplying yeast to other, richer areas of sugar and thus the speed-up. Sounds correct, anyway. Let us know if you get onto your friend's wood oven, and get to experiment with it. To find my blog, look under "Breaducation of a Rookie Fresh Tomato Bread". And I should add I was in error in saying there were pictures there of two breads; there were two pictures of the same Fresh Tomato Loaf. Can't wait to try out an oblong. Will be ordering one this week. Very glad you like the results, which confirm what several posts on TFL claim. Meanwhile, enclosing a B&W and a colour shot from my latest baguette batch, a la BBA L'Ancienne, except this time I did a Bertinet for 5 min, then pulled my dough out of fridge every 20 and did 6-7 S&F's. The other change I made was a 45 min proof on parchment before transferring to stone with steam. Added second cup of water at 2 minutes into bake, and reduced heat to 455. Then, halfway through, switched from convection to regular oven. I must say crust amd crumb were exquisite and these were best to date. So we both love baguettes, Ron, and both of us are developing our techniques every time out, judging from your posts. I made my first NKB yesterday and the result was not 100% satisfactory. I wasn't sure whether to leave it out in at room temp which is in the 80's here in HK or keep it in the fridge overnight. Your post today has somewehat addressed my concerns. I have also started a post last nite asking a similar question and have received some helpful advice from two TFLers. The dough from Jim Lahey's recipe is fairly wet and sticky, and he did only one S&F after the first rise (which I followed but forgot to let it rest for 15 minsand quicky shaped it for 2nd proof) . So it is fine to S&F during the refrigeration period at regular intervals, say 1 hr between S&F or can this be done at shorter intervals. My apoligies if I'm asking some seemingly stupid questions. I'm quite new at bread baking and unfortunately here in HK there aren't that many ppl who who are into bread making whom I can get advice from. Many thanks. Not sure if your post above is directed at me, but here goes. I have made very good NKB following Lahey's directions exactly. (See "Breaducation of a Rookie" post from June of this year.) Crust and crumb were excellent and ambient temperature was also, like yours, in the 80's. But for superior taste, I have since decided to go always with cold ferment. This means using more yeast. As for S&F during refrigeration period, to me it dosn't matter one way or the other. I have had great results just mixing the dough till flour absorbed, then not touching it until after it has been taken out of fridge and warmed and risen. You probably will find that your dough will rise a bit in the fridge if you do S&F, (when I do S&F, I do 6 or 7 folds every 20 minutes, three times, then leave it alone). But you probably will get very, very little, or none at all, if you don't do any S&F-ing.. If you do, I think you will find that it takes 4 hours or so out of fridge to ferment, while it takes 6 hours or so if you don't do S&F while cold. As for S&F after ferment, I don't advise it. I simply oil a bowl, throw some wheat bran or whatever in bottom and sides, and let it sit for 30 minutes or so. Then I very, very carefully transfer to hot pot. I have found that if I fold, following the Lahey method, I tend to get a tighter crumb, and I like a really, really loose crumb in my boules. This is one reason I usually don't S&F while it is in fridge. The loosest result comes when I do no cold S&F's, no folding when feremented through, and no proofing. Just upend the dough into hot pot when ferment is finished. the dough is exceedingly wet, and seemingly uncooperative, however, I find it workable by first flouring the surface of my marble fairly well, then flouring the exposed surface. I use my dough knife to hold the bottom as I stretch, and fold. Once it has a nice coating of flour, it is easier to manage. The coating usually gets absorbed over the second rise period. I will also throw in a technique that I'm sure Robert will disdain that was on the Lahey/Bittman video of 2009 (2006 is the original). I warm my water in the microwave for 45 seconds, and add 1/4 tsp of red wine vinegar. The rise time gets reduced from 12-18 hours to 3-4 hours, depending on the ambient kitchen temperature, this is part of the Lahey updated technique for impatient people. I don't use this procedure all the time, but when I do, I do not find a discernible difference between the long ferment, and the abbreviated ferment. Lastly, when I do the Lahey baguette, I am letting it second rise on its individual piece of parchment, which I lift as a tray, after slashing, and ease into the oblong LaCloche, gently. Sorry for delay in responding to yours, above. Wet dough does present challenges and flour in this situation is indeed the way to tame that quivering mass, as you underline in your post. Hoping to be using a cloche soon, Ron, and will advise on how it went. I'm going to give it another go and this time I'm going try and keep it in the fridge while I sleep (if only I can refrain from sneaking a peak at the dough throughout the night), I'll also throw in a few S&F after it has gone into the fridge during the first hr and give it another 4 hrs like you said, totalling 12 hrs or more and see if my bread comes out better. Meanwhile, I'll be doing a lot of reading on Jim Lahey's book. Please let us know how your cold method works out for you, giving details of what you did all the way from beginning to end. And please inform us about the crust crumb and flavour too! Here's hoping it goes splendidly. Here's a few pics of my cheese bread dough. I've decided to let it proof in room temp for 10 - 12 hrs as I'm out most of the day tomorrow and would bake the bread first thing in the morning before I'm out of the house. 1, Here's the mixed dough, note that I have only used 200 grms of flour consisting of 150 grms bread flour , 50 grms of wwf incl approx 2 tbsps of wholemeal flour for extra fibre. 6 After fermenting for 3 hrs at 22:20, dough appears to be slacker with plenty of air pockets when I look from under the glass bowl. So far so good? My bread is now in the oven and while I'm waiting for bake, I thought I would continue to post pics of the dough throughout its progress since last night. It has now been sitting in room temp for about 11 hrs and ready to be degassed. A pittifully small loaf going into the oven..
Because of the small size, I'm baking it at 250C for 20 mins, reduce heat with lid removed and let see what the bread looks like in a little while. And the loaf wouldn't be complete without the crumb shot. I'm quite happy with it and can't wait to make a bigger one. The crust could be a little more browner but I didn't want the bottom to burn. This bread would go very well with some hot soup. I really like this bread. Thank you again for everyone who came on to give me advice and encouragement. I appreciate you giving me a full picture (here and in your last post) of how you made this loaf, from beginning to end, as I had asked you to. Especially interesting to me was the temperature you were at with the lid off. But how much of what kind of cheese did you use, and when and how did you "insert" it? I have just realised that with my step by step pics, your very aptly titled thread can be used as a guide for other rookies who may be interested in making the NKB. Since the dough was quite small, it took me only 20 mins with lid on at 250 to get to this colour. I took the temp of the loaf and it was almost cooked by then. I just turned it down to 220/230 and left it it there for 10 mins. I cheated with the cheese this time, I didn't grate my own, I bought a packet of the Sargento shredded 6 Cheese Italian consisting of Mozzarella, Smoked Provolone, Asiago, Parmesan Romano & Fontina Cheese according to the packet and put it 100 grms. It smelled good but I may reduce the amount to 150/170 grms if I were to use for the normal recipe or maybe use half the salt instead. It turned quite hard by the next day. Could have been the melted cheese that gave the bread a very slightly sticky/caramelized crumb when cooled. May be better eaten toasted the next day. Now that I have some idea of how the dough looks like, I may try putting it in the fridge. The only disadvanage is that I will have to take out a lot of the stuff in there to make room for the bowl, which is not a good idea in this hot weather. Sorry for the delay in answering your post. I just didn't see it till now. The info on cheese that you provide is helpful to me, as guide to my next cheese loaf. And hey, it isn't cheating to use assorted cheese-packs. The ones included in the packet are all tasty, and when combined, wow! Yes, salt probably ought to be reduced given the cheese ingredient. Your crumb was caramelized? Or did the cheese in the crumb simply get sticky-ish when cooked (as it would in a cheese sandwich put under the broiler)? Why put dough in fridge? Just asking what your reasoning is. for the crumb but it was the stickiness that made the bread a little hard. However,I lightly toasted the bread this morning and it wasn't too bad afterall. I thought putting dough in the fridge is what cold fermentation is all about and what you've been advocating all along in your earlier comments?? I've been fermenting the dough in room temp this time but didn't you say that cold fermentation "delivers a superior taste"? As far as I've been reading, Robert is an advocate of refrigeration, so maybe his question was posed wrong, as it confused me as well. As far as refrigeration is concerned, in my opinion, the pain a l'ancienne formula is a refrigerated formula and the Lahey No Knead is not although neither is technically kneaded. I think though, that with all the stretching and pulling on the pain a l'ancienne, it begins to approach kneading although called something else, not that theres anything wrong with kneading. The Lahey NKB has the best crust when it first comes out. Proofing it in a brotform that is coated with semolina, however, also gives it a nice crust for a while longer, and certainly toasting it reawakens some of the crunch too, as you've tried. Nice to hear from you once more. I simply think combining an initial long cold ferment with the pot method makes sense, for the reason I mention in my reply to Judy (below). I have lately added S&F during refrigeration, also something "contrary" to Lahey, because I find it prevents an over-abundance of large holes in the finished product, to the detriment of a truly open structure throughout. To be clear: S&F-ing gave me fewer gigantic holes, but many, many more smaller holes spread throughout the whole loaf. (See the crumb structure in my post "Into the Pot With You", as opposed dramatically to the crumb structure in "Breaducation of a Rookie".) In BBA, Reinhart advises mechanical mixing, but I am an advocate of hand-mixing in each and every circumstance. 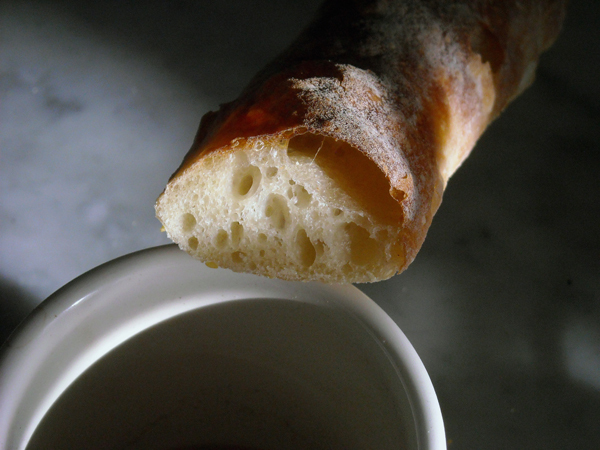 Initially, I never used to knead at all once the flour was thoroughly incorporated---even when making BBA baguettes. The S&F-ing I do now, both for baguette and pot dough is therefore another thing not in the recipes promoted by Reinhart or Lahey, although I suppose it substitutes, more or less, for machine mixing in Reinhard's recipe, and is of course a form of very efficient kneading. As for stretching being a kind of kneading, I am hesitant to describe the technique as "ALL the stretching and pulling", in the case of ancienne baguette shaping---because really, there is darn little to it---nor would I say it begins to approach kneading. It is a post-mixing, post-bulk fermentation shaping technique even Calvet uses to make baguettes, (he both pull-stretches AND rolls the dough out to extend it). It is a great help in creating larger holes when the loaves have undergone extensive handling in the pre-shaping and shaping phases used by Calvet and most others. On the other hand, I believe Reinhart would say that the "hole problem" is not really a problem in the ancienne method, because the dough to that point has hardly been touched, let along shaped and re-shaped. So I believe stretching in BBA technique is more a matter of working towards a longer, better shape, and giving the still-active yeast and added impetus to continue working. It is a way of avoiding shaping-out the holes, even while it makes it easier for the dough to continue fermenting--- a goal of all shaping techniques. As far as crust is concerned, I found no difference between crusts when S&F present and absent, and where intial ferment is cold or warm. But that is just my experience. I understand now what you mean by caramelization. Thanks for the clarification. Yes, I am an advocate for cold fermentation, after carefully testing the dramatic difference in taste between room temperature and refrigeration temperature ferments. Of course, most of the fermentation actually takes place after you remove dough from fridge, and it begins to warm up. For me, this usually takes 6-8 hrs. But the point of putting dough in fridge is to retard the yeast fermentation long enough for certain enzymes and bacteria to develop flavour. While the recommended very small amount of yeast used in ambient temp fermentation does mean a somewhat retarded ferment, I believe the theory is that starting out cold, and keeping it cold for a long time, does a much better job. Which is why I use it for most of my baking now. I responded as I did to your post because I was not sure what you meant -- whether you wanted to ferment at ambient, then put in fridge, or start off in fridge and then remove to room temperature --- the exact opposite. The main reason why I wanted to try cold fermentaton is that I wasn't sure if the high temp in HK would create havoc with my dough while I slept and cause my dough to over-proof. However, Margie, another TFLer from another forum very kindly told me that room temp is very similar to HK and fermenting it for 12 hrs worked well for her and so I took her advice. Now that I have seen for myself how the dough behaves during the fermentation, I can either continue to ferment at room temp or adjust my schedule and try leaving it in the fridge after I'm done with the mixing. I still like to do a few s&F before it goes in the fridge as I find that it makes my dough softer and smoother like the traditional push and roll method that I've been taught to use when I first started baking bread. I may try bakeing the bread in the pot at a slighty lower temp as it gives me a burnt bottom, not so much that it becomes inedible but just doesn't look too appealing. I'm also hoping to do an oblong loaf next time and using a larger pound cake tin as the cover...I wonder if that would work? ?